Forum topic - new rules, new publisher, Richard Baker still on the team. A.Net has a new look. Try it on a small screen. In celebration of Alternity Game Day 2015, pick one of these. - Get someone interested in alternity. - Join an online Alternity game. - Do that Alternity thing that you've been meaning to. JSM3050 found a scanned copy of The Future's Edge. It's free, take a look. There was a problem with email, so most members will be receiving backlogged emails from this website today. 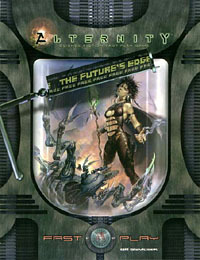 Alternity is not officially available for purchase anywhere except second-hand. JSM3050 wrote a letter to WoTC asking for official reprints and/or digital sales on DriveThruRPG - topic. Maybe a few more fan letters would encourage the sales dept. AlternityRPG.Net on Google Plus, if(?) you need it, link. Alternity RPG Community page on Google Plus - join it, share it. Both books are from the Star*Drive Stellar Ring Netbook project which expands on the Star*Drive campaign setting. This is quite an epic resource - Alternadrive. Check it out if you like vehicles! Supers, Urban Fantasy, and Star*Drive Space Opera - details here. You got a really cool idea for Alternity? A short story, set in one of the published settings, or your own homebrew? How about that uber-death ray blaster that can double as an intergalatic space freighter? (Ok, that last one was just silly...) If you have an idea that has been, or perhaps needs to be in print for the rest of us to use and abuse, submit to Last Resort! For a springboard of ideas, you can check out the column titles we have in the table of contents for underutilized columns LR has such as Domain Virtua for Gridsites, or perhaps Future Shock!, tech of PL9+. Perhaps your talents lie in the more visual, and you can sketch weren in your sleep, or render a starship in some computer program... if you'd like to get your art out there, and would like to work collaboratively with a writer's vision... sign up for the Last Resort! Last Resort is a volunteer effort of fans of Alternity for the fans of Alternity... To join, navigate your way to http://games.groups.yahoo.com/group/lastresortmagazine/ or drop me a line with your intentions... Please put "LR7 Submission" in the subject line so my spam blocker won't eat your hard work. Last Resort is an Alternity magazine, the latest edition has been released this week. Download a free copy here. Leave feedback and comments, the contributors greatly appreciate hearing your thoughts about their work. In an effort to reduce unnecessary email traffic, forum members who have not logged in for 2 years will be automatically unsubscribed from all Forums and Topics.